Who Was St. Nikephoros of Constantinople? 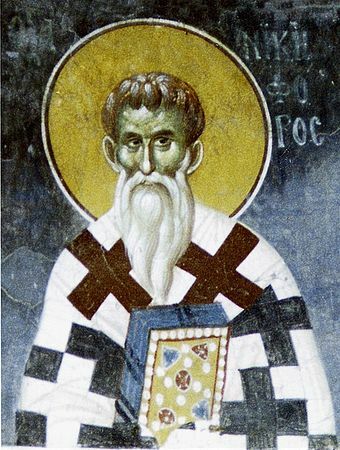 Saint Nikephoros was born in Constantinople about the year 758, of pious parents; his father Theodore endured exile and tribulation for the holy icons during the reign of Constantine Copronymos (741-775). Nikephoros served in the imperial palace as a secretary. Later, he took up the monastic life, and struggled in asceticism not far from the imperial city; he also founded monasteries on the eastern shore of the Bosphorus, among them one dedicated to the Great Martyr Theodore. After the repose of the holy Patriarch Tarasios, he was ordained Patriarch, on April 12, 806, and in this high office led the Orthodox resistance to the Iconoclasts' war on piety, which was stirred up by Leo the Armenian. Because Nikephoros championed the veneration of the icons, Leo drove Nikephoros from his throne on March 13, 815, exiling him from one place to another, and lastly to the Monastery of Saint Theodore which Nicephorus himself had founded. It was here that, after glorifying God for nine years as Patriarch, and then for thirteen years as an exile, tormented and afflicted, he gave up his blameless soul in 828 at about the age of seventy. He is annually celebrated by the Church on June 2nd.